Happy Wednesday! Today I’m sharing my spring wardrobe wish list essentials. I started taking note of things I want to buy come payday to add to my spring wardrobe and play with the spring trends I have been seeing. I love fashion this time of year and it is so my style so I always look forward to seeing what’s new and changing up my wardrobe. Sometimes I love incorporating the trends and other times I go my own way and experiment but this latest spring style has me in love from the clothes to the hair accessories and all the bags and shoes that are popular right now. So I’m just going to show you what’s on my spring wardrobe wish list essentials and which trends I’m totally going to wear! As always, florals are always in and I love that as I have very many floral dresses. I have seen a few I am eyeing including this pink floral one which is me and a dress and it comes in plus size so maybe it will be a little longer on me. Next is this bow tie cut out sun dress and this just screams spring and will look so cute with all the accessories I choose as well. I can totally see me in dresses like this when the weather is warm and there’s a light breeze. I want to incorporate more lilac in my wardrobe. I think lilac was a thing last year but I still see a few lilac pieces and it’s a pretty color. I have so many pink sweaters/long sleeve tops so when I saw this lilac one I knew I had to have it. The lilac dress would be so perfect for a formal spring event like a wedding. I actually already own this and can’t wait to style it. I just had to add it as it’s pretty and gives you an idea. As for bottoms, I picked a few as I don’t own too many and need to add more in my wardrobe. I’m starting with the paper bag trend which I am all about. I own a red pair I wore on Christmas here and love them and glad they are back for spring. The blush pink are calling my name and I already have an idea how to style them that I can’t wait to pick up a pair. I then saw the short version and even skirt version so you know I will be getting some in a few spring colors as well. I tried on a wrap skirt recently and love the thought of them but I bought one in a size too big so I need to find one that fits me but I can’t wait to wear skirts again. Last is the white jeans and I already bought a pair but I know they will be so big and I never tried white denim before so I can’t wait to style them and see how I wear them. As for the last item on my spring wardrobe wish list essentials is a denim jacket. I have been on a hunt for the perfect one and I still haven’t found one but this looks so pretty. I can see it paired with the spring dresses and just adding something to an outfit. I will let you know when I get one as it’s the first thing I need to pick up come payday. 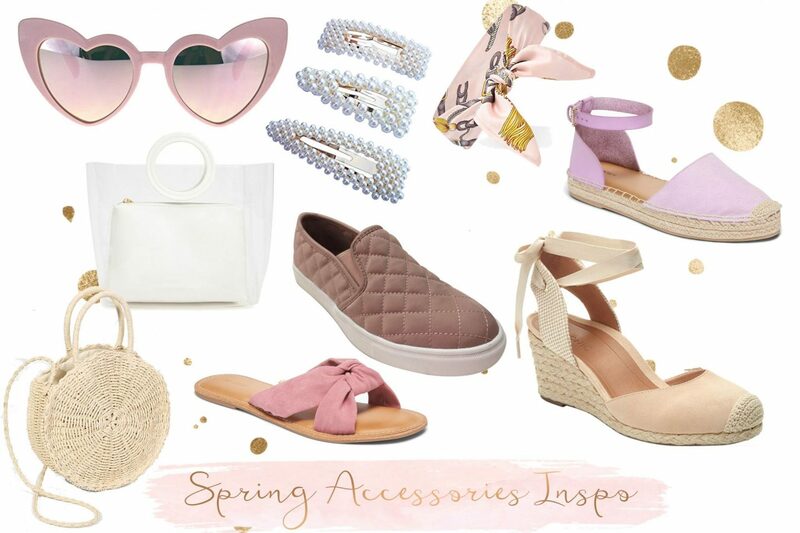 The accessories this spring as got me in awe! I absolutely love everything I am seeing because there are so many fun hair accessories and you know I love a good accessory in my hair. I’m kind of sad gigantic bows are not too popular but that’s not going to stop me. I mean bows are still a thing but instead of the bow barrettes the hair scarf is a thing and you can still tie it in a bow. I have that hair scarf and can’t wait to add it to my hair and even my handbags too. Then the next hair accessory is the oversize pearl barrette and I love that. I am totally grabbing some and adding them to my hair. They remind me of ones I wore as a little girl and love that they are back. I also love the ones with words or sayings too. I do love a good pair of sunglasses and I didn’t know I had quite a collection until I counted them. I have a red pair I wore on Valentine’s day here but the pink ones scream spring and even summer. I love bags and have a serious problem buying too many. I only picked 2 out this time as I already bought a few for spring already. This clear bag is so cute and love this trend. I saw there is a designer version but I found this one for way less cheaper at Forever 21 if you are like me and just want to try the trend and not fork out the cash on a trendy bag. I really am debating to get this or the next one. I love the circle straw bags and again I saw this for such a steep price but this is only $14 which is such a good price. I love how this bag is so popular and I love trying out popular bags for the season. Now to decided which of the two bags I should get or if I should buy both. I’ll keep you updated which is the winner. Lastly are the shoes and I am in love with so many shoe trends. I can’t decided and want them all. I actually bought the espadrille wedges as I knew they were so popular and I don’t own a shoe like that anymore. It is so pretty and can see it paired with a lot of my spring wardrobe. As I said I want to add more lilac to my wardrobe and these flat espadrille sandals are so cute and if you prefer the flat version more then a wedge then this is perfect. I love sandals like this in spring. Next is a bow slide. I actually don’t own something like this as I mostly wear flip flops but I thought I would switch it up and try a slide. I saw a designer version with bows but it’s way too much so when I saw these I knew they were great alternatives and I love them. They’ll be a great easy to throw on slide when you need to pop out and don’t want to think about your shoes too much. The last shoe of my spring wardrobe wish list essentials is these blush pink quilted slip on shoe. I know I’ll be doing a lot of walking and I don’t own a shoe like this which is easy to throw on and make your outfit cute and casual. Those were my spring wardrobe wish list essentials! If you want to check out last years spring wish list then I made one here to see how the trends were and what I added last year. I am so excited to pick a lot of these up and share my spring style with you. I can’t wait as it’s my first spring in LA and I have so many locations planned and outfits written in my notes to have them ready. 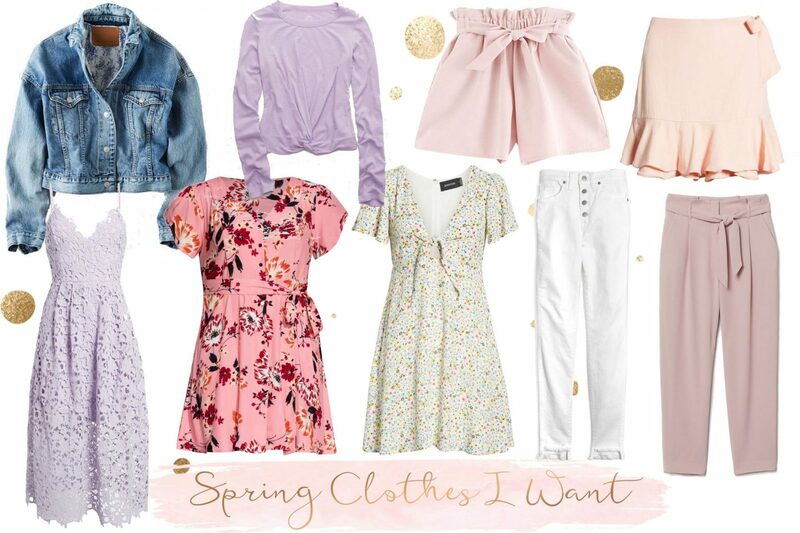 So I hope you got some spring inspo as well and let me know what’s on your spring wardrobe wish list essentials or any trends you will be trying out as I’d love to know as maybe I missed some or need to add more to my list. I love florals! I definitely need to hop on it and go get some great spring pieces! All those pieces are gorgeous! I really want to get some fun hair clips for this spring and summer, I love that it’s a trend on the rise again! So cute and feminine! Love it!